Every year since I was seven, my family have been going to Norfolk for Easter weekend. We stay in our caravan on a sheep farm in North Norfolk and we pretty much visit the same places and do some of the same things each year. I've gotten to know North Norfolk pretty well by now and it's one of my favourite places in the world. I thought I'd put together a little weekender's guide to tell you about some of the best places to go. 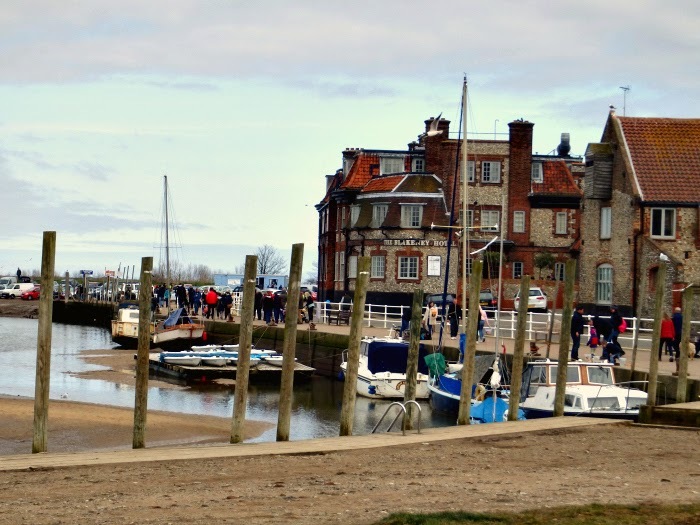 We visit Wells on Good Friday to have fish and chips and visit the many cute little miscellaneous shops that line the main street. There are plenty of charity and secondhand bookshops in Wells, one of my favourites being the Old Station Bookshop, a beautiful converted old railway station packed to the rafters with both antiquarian and modern books. 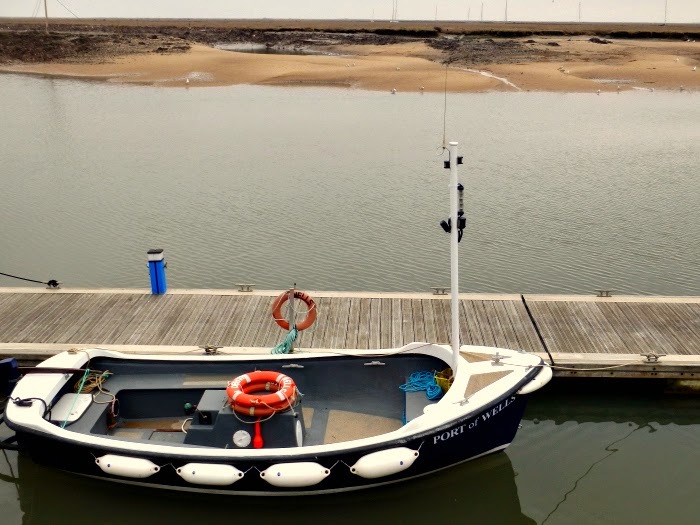 French's is the only place you should be going for fish and chips, it's the absolute best in Wells, and if it's nice weather we sit on the dock and look out at the boats. There's sometimes a queue but it's definitely worth waiting for. Head to John's Rock Shop afterwards for ice cream and candyfloss, I can never resist. Wells beach is one of my favourite places in the world, I think I feel the most happy and free when I'm by the sea, there's just something about it I can't explain. The big Norfolk sky seems to stretch on forever and the golden sand is just the right colour. The beach huts at Wells are the prettiest I've ever seen and seem to stretch for miles. This year we took a travel kettle and had tea and cake on a picnic blanket, looking out to sea, it was perfect. Holt is a lovely little town full of delis, charity shops and little boutiques. It's a great mix of high and low end. In the past we used to eat at Byford's deli, but I think recently waiting times have gone up and food quality has gone down so we've moved on to other things, but we still stop by the deli for treats and baked goods - the fudge brownie is amazing! 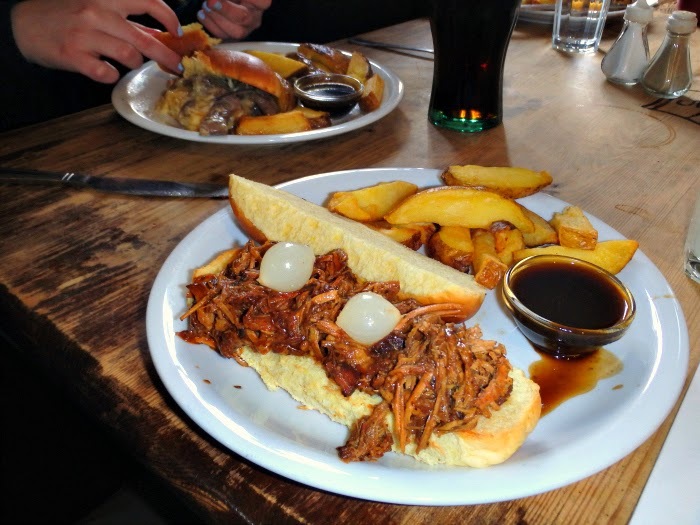 This year we went to a gastro-pub on the main stretch called The King's Head for excellent hogies and fried chicken. I can highly recommend the brisket hogie! It's always worth popping into Bakers and Larners to look around, especially if you're a foodie, it's been running since 1730 and is a much-loved institution. We often stop by the visitor centre at Cley marshes for tea and cake, there's a lovely view out over the marshes to the sea. Ah that big Norfolk sky again. Afterwards we usually head to the beach and let the dogs run loose. We always head to Blakeney on Easter Sunday after church. The King's Arms (why are pubs always called the king's something?) 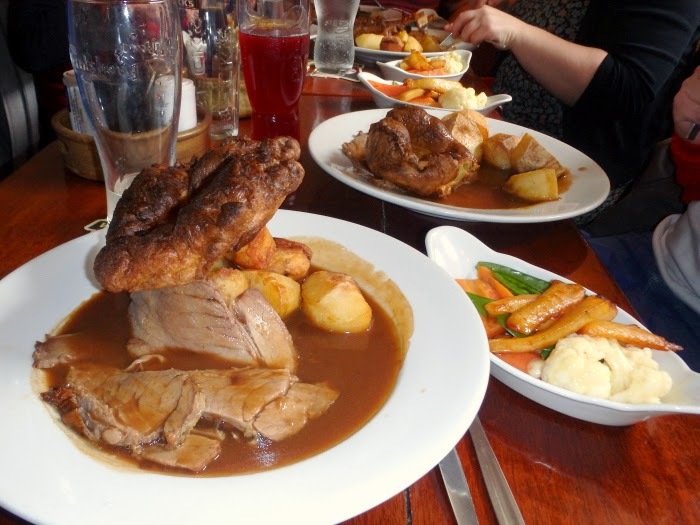 serves a humongous Sunday lunch that I've never yet been able to finish. There's a book fair down in the church rooms on the front with six books for a fiver that's always worth going to, I'm not sure if it's there all the time but it always seems to be on bank holiday weekends. If you're up for some crabbing, Blakeney is a great place for it and it's a lovely way to spend a sunny afternoon. There's also a lovely long walk along the marshes. This beach, along with Holkham, is my second favourite beach in Norfolk. Forget Cromer, this beach is simple and often quiet, perfect for long walks and picnics in the grassy dunes. Again, the big Norfolk skies are hard to beat and many a happy bank holiday Monday has been spent here. I suggest The Hero at nearby Burnham Overy Staithe for a delicious lunch, but head there early as they tend to stop serving at 2:30pm. An honourable mention goes to Burnham Market - a posh little village sometimes referred to as London-on-sea for it's inhabitants. It has a few little tea shops and bookshops and a Jack Wills - what kind of village has a Jack Wills?! But it's quite nice for a little potter about and The Host Arms is lovely but quite expensive. So those are my favourite places to visit in North Norfolk! I took so many photos at Easter that I think I'll put together a photo diary of the trip sometime soon. I'm not the best photographer in the world but I'm enjoying the opportunity to work on my skills and it's a nice creative outlet, alongside this blog. Have you ever been to Norfolk? Where's your favourite place to go?